AP SGTs Eligible for Promotion to SA Languages Posts Rc 2237 : Filling up the posts of SA Languages by the way of Promotions - implement the orders of Hon'ble APAT in OA.317/ 2017 Dt.10/2/2017 and Batch- orders issued. 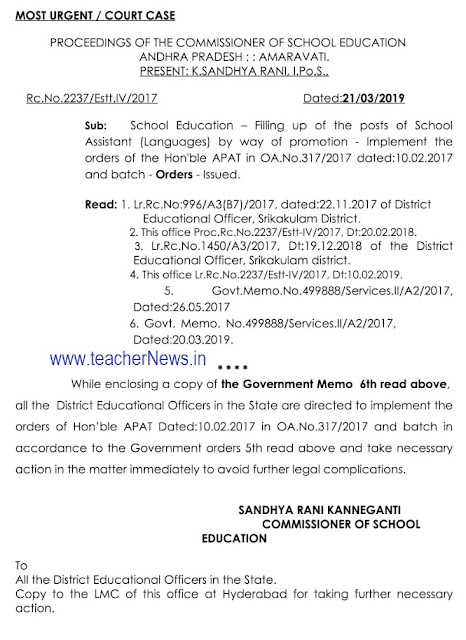 CSE Rc.2237, Dated 21/3/2019 Rc 2237/Estt/I/2017 Dated 21.3.2019 School Education - Filling up of the Posts of School Assistant Languages by way of Promotion - Implement the orders of the Hon'ble APAT in OA No 317/2017 dated 10.02.2017 and batch. 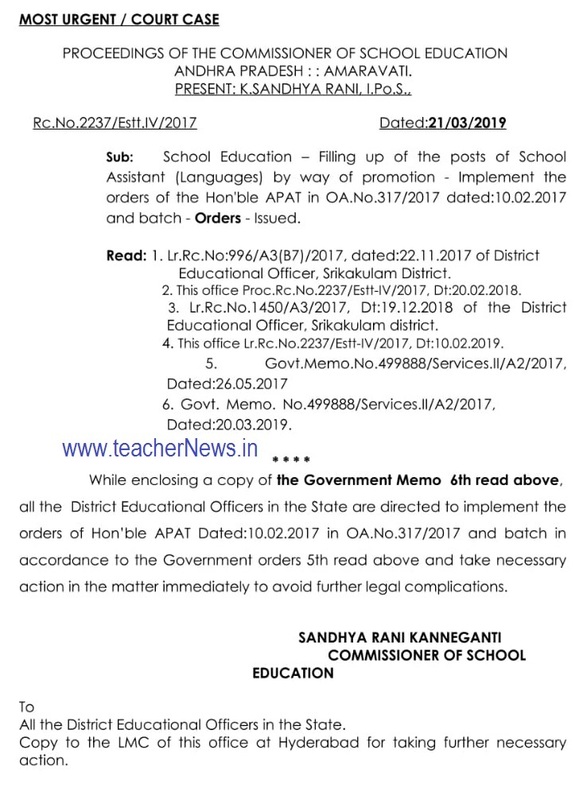 While enclosing a copy of Government Memo No 499888/Services.II/A2/2017 dated 20.3.2019, all the District Educational Officers in the State are directed to implement the orders of Hon'ble APAT Dated 10.2.2017 in OA.No317/2017 and batch in accordance to the Government orders 5th read above and take necessary action in the matter immediately to avoid further legal complications. AP SGTs Eligible for Promotion to SA Languages Posts Rc 2237, SGTs Eligible for Promotion to SA Lang Posts Implement OA 317/2017.